Today is the last day of taking antibiotics for the bladder infection and I’m thrilled! The side effects have been awful! Headaches, nausea, dizziness, cramps, etc. making for a tough and looooong short week at work! So it was great to relax at home most of the day getting in a little gym time and couch time with these guys. 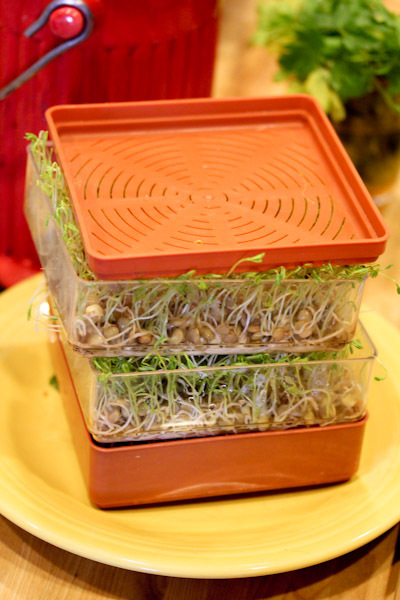 And I finally harvested my lentil sprouts, after 6 days they were out of control! 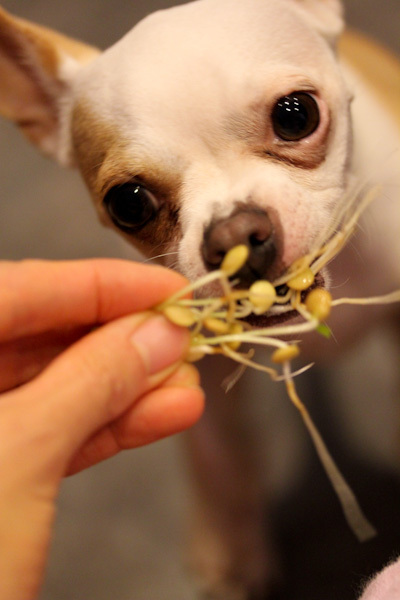 I learned that I’m not the only fan of sprouted lentils in the house, Miko was quick to clean up the floor droppings and happily ate any I offered him. Who knew! My list of vegan foods he loves is growing, I also discovered he’s a watermelon fan this week. 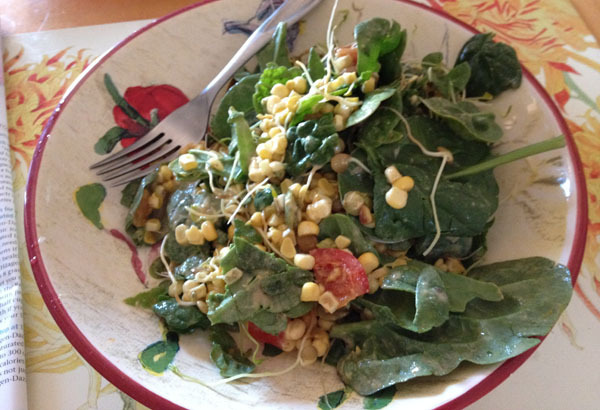 I enjoyed loading a huge lunch salad with the sprouts, fresh corn, spinach, and a hummus dressing. Dinner was more exciting because we had a last minute pizza-making party at my sister’s house where they made fabulous dough and laid out an huge range of toppings for everyone to make they’re own creation. 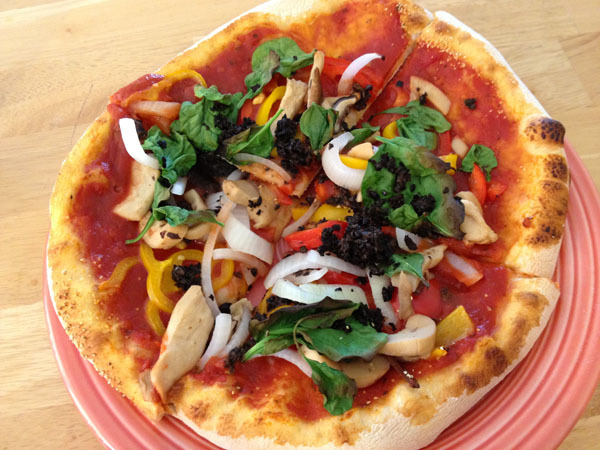 I created a vegan masterpiece by layering on spinach, mushrooms, ground olives, onions, peppers, fresh marinara sauce, and sprinkled with nutritional yeast before placing on a heated pizza stone and baking at 425 degrees for 8 minutes. The crust came out perfectly, thin and crispy and the nutritional yeast created a creamy cheese texture with the marinara sauce. After a huge pizza dinner and maybe a few watermelon vodka cocktails from the Vitamix, I’m totally relaxed and looking forward to a good night’s sleep and getting back to normal health tomorrow! I’m so glad you’re almost done with the treatment! You poor thing. 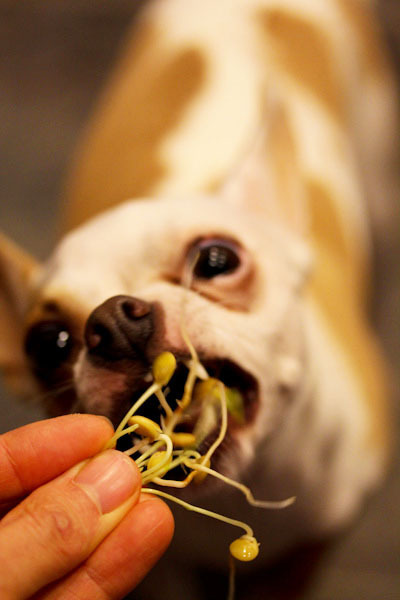 Those lentils sprouts look divine – love that pup digs ’em, too! Glad to hear you are better! Great pictures! I love the sprouter! Where did you get that? I usually use mason jars, but this allows for the lentils to spread out. That watermelon/vodka sounds yummy. It’s works well for lentils and other larger beans, but not as well for mung bean sprouts and smaller seeds, so I still use a jar for those.